The Jazzy Select 6 Power Chair is one of the most luxurious power chairs in regards to both design and ride. 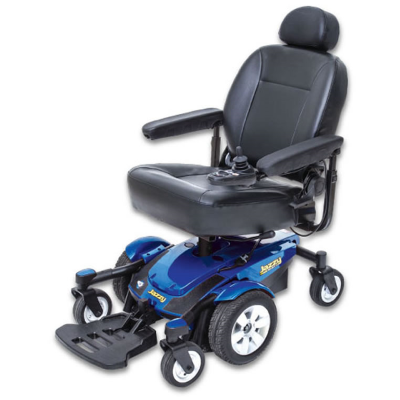 Designed by Pride Mobility, the leaders in mobility products, the Jazzy Select 6 features a center wheel drive train for tight turning radius’ making it great for in home and outdoor use. Travel up to 15 miles per charge, and includes battery, charger and Captain Style Seat. *Colorado Only. Free delivery. Visit our store to test drive it today. The Jazzy Select 6 Power Chair provides maximum front stability, combined with the advantages of in-line motor technology. Active-Trac® Suspension and six wheels on the ground allow for superior performance indoors and out. An impressive selection of standard convenience features make it the easiest power chair to use. Fully electric with easy to use hand controls and joy stick. Select your speed setting based on your personal preference.